Our goal in this paper is to provide an introduction for asset allocators to the international small-cap asset class by detailing its attributes in terms of performance, volatility, correlation, and fundamentals. Because asset allocators often compare international small-cap with international large-cap, we thought it was particularly important to examine the long-term relative performance of these two asset classes to highlight the regular frequency with which international small-caps outperformed their large-cap siblings. Knowing that the risk/return trade-off is always relevant when analyzing different asset classes, we also include volatility comparisons which show that international small-cap’s superior performance record came with less incremental volatility than many financial professionals might expect. We then go on to examine how the two asset classes fared in different market environments, such as rising and falling equity markets and rising and falling interest rates periods, which showed that certain periods resulted in even wider positive relative return spreads for international small-caps. To enhance international small-cap’s attractive attributes on a standalone basis, we demonstrate the benefits of adding the asset class to a global multi-asset portfolio. 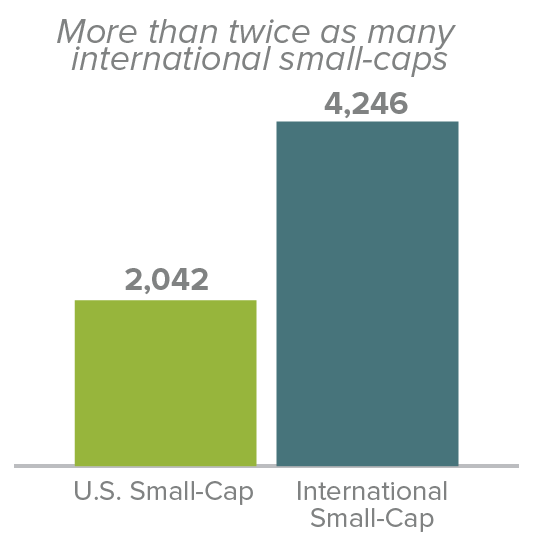 International small-caps have historically had a lower correlation to U.S. large-caps than either international large-caps or U.S. small-caps. This lower correlation allowed international small-caps to be additive on both an absolute and risk-adjusted return basis to a global multi-asset portfolio. Finally, we look at some indicators that suggest, at least to us, why the current period offers a compelling and timely opportunity. We conclude by highlighting some fundamental factors that we believe make the asset class potentially fertile ground for active management. 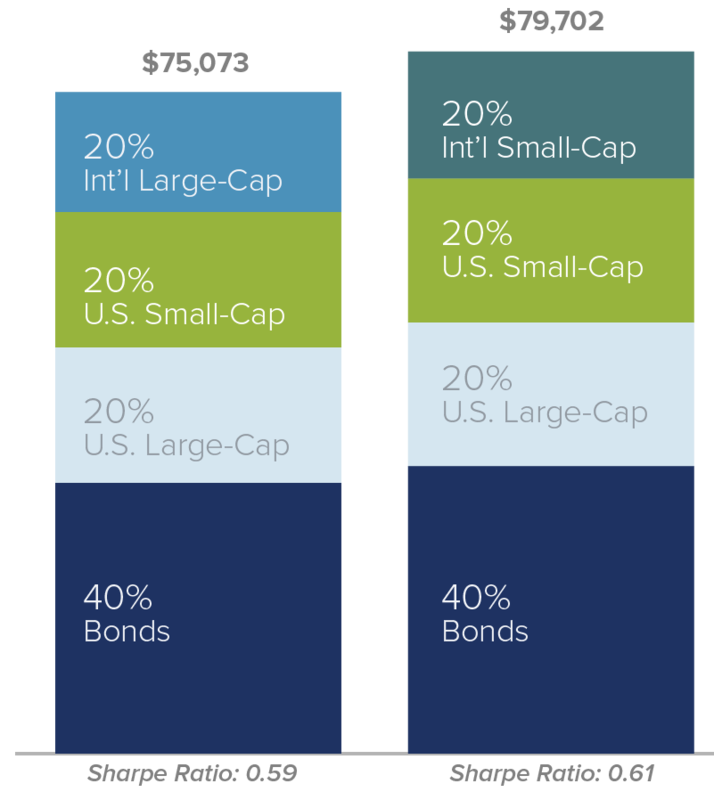 Considering that only about 1%1 of mutual fund assets in the U.S. are invested in small-caps outside the U.S., we suspect that many asset allocators think of international small-caps (if they think of them at all) as a nearly indistinguishable subset of the large non-U.S. equity universe. If this is correct, international small-caps would seem to be facing an uphill climb toward recognition as an accepted asset class, much like their stateside cousins did more than two decades ago. However, the facts tell a story that should level that hill. Many asset allocators will be surprised to learn that the total market value of the companies in the MSCI ACWI ex USA Small Cap Index, our proxy for international small-caps, is twice as large as that market capitalization of the Russell 2000 Index. Source: FactSet as of 12/31/18 ”U.S. Small-Cap” is represented by Russell 2000, and “International Small-Cap” by MSCI ACWI ex USA Small Cap . By market value alone, international small-caps would seem to merit consideration for inclusion in a globally diversified portfolio. However, their performance record makes an even stronger case for its inclusion as part of an overall equity allocation. (All of the results that follow begin with the first full month of performance for the MSCI ACWI ex USA Index on 5/31/94). Past Performance is no guarantee of future results. “U.S. Large-Cap” is represented by Russell 1000, “International Large-Cap” by MSCI ACWI ex USA Large Cap, “U.S. Small-Cap” is represented by Russell 2000, and “International Small-Cap” by MSCI ACWI ex USA Small Cap. In fact, international small-caps have lower volatility than the U.S. small-caps and only marginally higher volatility than international large-caps, based on rolling 10-year standard deviation. Additionally, over this same rolling 10-year period, international small-caps tied with small-caps for the best risk-adjusted returns, as measured by Sharpe ratio, of these four asset classes. “U.S. Large-Cap” is represented by Russell 1000, “International Large-Cap” by MSCI ACWI ex USA Large Cap, “U.S. Small-Cap” is represented by Russell 2000, and “International Small-Cap” by MSCI ACWI ex USA Small Cap. 1 There can be no assurance that companies that currently pay a dividend will continue to do so in the future. 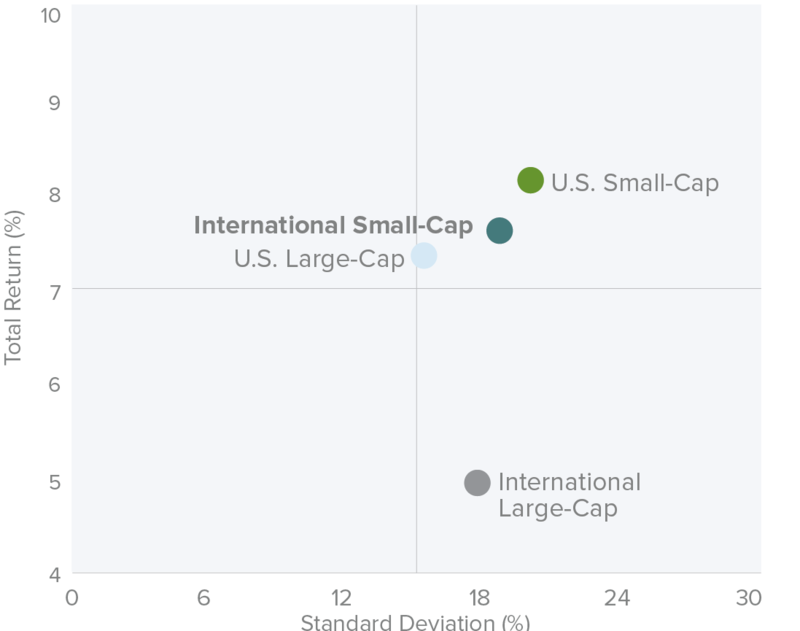 As one might expect, international small-caps have a lower correlation to U.S. larger-caps than either international large-caps or U.S. small-caps. To test the performance and volatility effects this lower correlation might have, we ran results for two hypothetical multi-asset portfolios. For each, we charted hypothetical returns (measured by the growth of $10,000), standard deviation, and Sharpe ratio. Both portfolios were rebalanced quarterly and encompassed the same time period, 5/31/94-12/31/18. 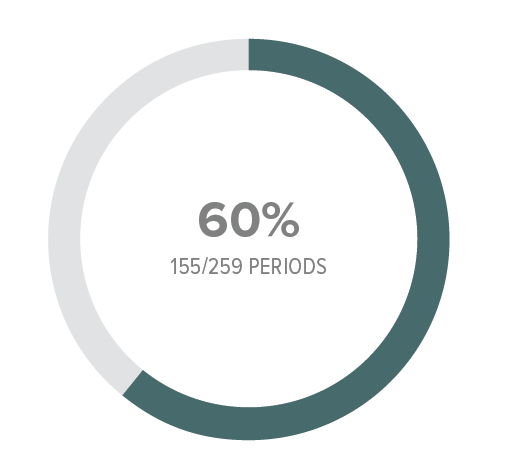 The first portfolio we constructed had 40% of its assets in bonds and 60% in stocks, with the latter allocated evenly among domestic large-caps, domestic small-caps, and international large-caps. In the second portfolio, we made only one change—we swapped the international large-cap allocation for an allocation to international small-caps. While both multi-asset hypothetical portfolios showed strong standard and risk-adjusted performance, the portfolio with the international small-cap allocation had higher absolute and risk-adjusted returns as well as lower volatility. This is as strong an argument as we believe can be made in favor of allocating to international small-cap stocks. “Bonds” are represented by Bloomberg Barclays US Aggregate, “U.S. Large-Cap” by Russell 1000, “U.S. 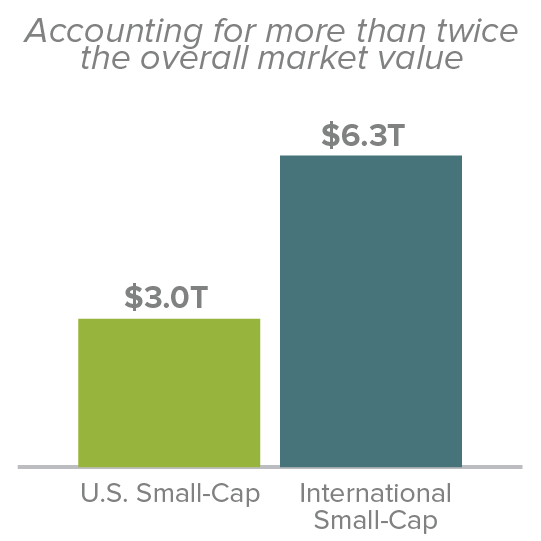 Small-Cap” by Russell 2000, “Int’l Large-Cap” by MSCI ACWI x USA LC, “Int’l Small-Cap” by MSCI ACWI x USA Small Cap. The above chart is shown for illustrative purposes only and does not reflect the past performance, or project the future performance, of any investment. The performance of an index, such as those used above, does not represent any particular investment as you cannot invest in an index. The Sharpe Ratio is calculated for a specified period by dividing an investment’s annualized excess returns by its annualized standard deviation. The higher the Sharpe Ratio, the better the investment’s historical risk-adjusted performance. Analyzing monthly trailing one-year returns from 5/31/94-12/31/18, which consists of 284 periods, we found that while international small-caps outperformed large-caps over most rolling time periods, there were market conditions in which the performance spread was greater than others. We analyzed monthly trailing one-year data from 7/31/96-9/30/18, a span that yielded 255 periods. “International Equity” is represented by the MSCI ACWI ex USA IMI Index. Among the other compelling reasons to consider allocating to international small-caps is the timeliness of the opportunity. Prior to 2017, the initernational small-cap index had underperformed the U.S. small-cap index by the widest spread since the inception of the international small-cap index. As of 12/31/18, the performance spread between the two indexes was still below its historical average. International Small-Caps Poised for a Rebound? The 10-year average annual total return through 12/31/18 was 10.02% for the MSCI ACWI ex USA Small Cap and 11.97% for the Russell 2000, -1.95% represents the difference. It’s worth mentioning that when non-U.S. stocks as a group outpaced their domestic cousins, international small-cap outperformed their large-cap peers 80% of the time—and by an average spread of 6.2%—for all monthly rolling one-year periods from 5/31/94 through 12/31/18. When International Has Outperformed U.S.
“U.S.” is represented by the Russell 3000 Index and “International” by the MSCI ACWI ex USA IMI Index. “Int’l Large-Cap” is represented by the MSCI ACWI ex USA Large-Cap Index and “Int’l Small-Cap” by the MSCI ACWI ex USA Small-Cap Index. 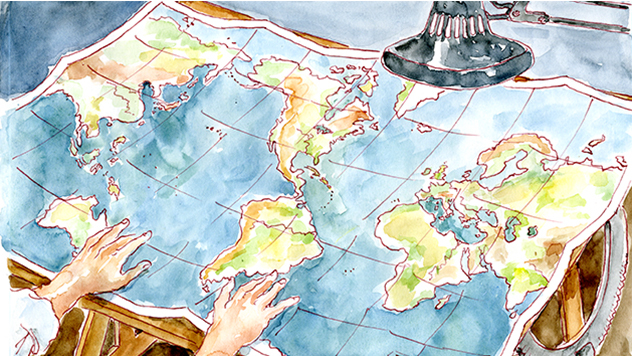 There are more than twice as many international small-caps as domestic small-caps, providing ample opportunity for active managers to search for mispriced stocks. Further, international small-caps offer access to local, regional, and global businesses hailing from a diverse group of 46 countries. More than 30% of the companies in the MSCI ACWI ex USA Small Cap were receiving one or no sell-side analyst coverage versus 15% for those in the Russell 2000 as of 12/31/18.1 This provides an active manager with a potentially sizable analytic advantage. Loss-making international small-cap companies have historically lagged. In fact, companies with positive earnings have outperformed the international small-cap index, gaining 12.1% versus 11.1% on an average annual total return basis from 1/31/03-12/31/18. A manager who focuses on non-U.S. small-caps with established histories of earnings may therefore also be able to potentially enhance returns. 2 January 2003 is the first month which Royce has access to fundamental data on MSCI indexes. 3 Return on Invested Capital is calculated by dividing a company’s past 12 months of operating income (earnings before interest and taxes) by its average invested capital (total equity, less cash and cash equivalents, plus total debt, minority interest, and preferred stock). The portfolio calculation is a simple weighted average that excludes cash, all non-equity securities, investment companies, and securities in the Financials sector with the exceptions of the asset management & custody banks and insurance brokers sub-industries. The portfolio calculation also eliminates outliers by applying the inter-quartile method of outlier removal. Our next step was to ask what history can tell us about the potential advantages for active management in the international small-cap space. 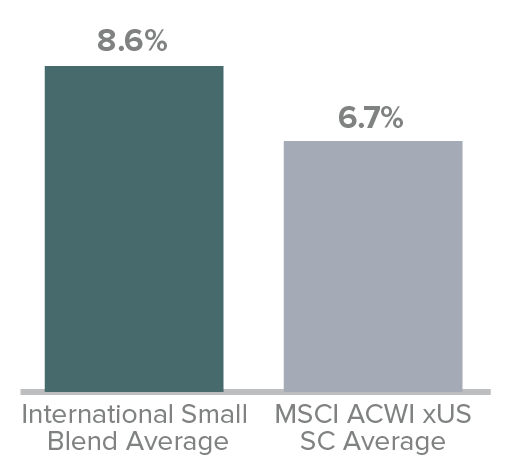 We compared performance for the average international small-cap mutual fund, using Morningstar’s International Small/Mid Cap Blend average, to the MSCI ACWI ex USA Small Cap index over rolling five-year periods. The majority of the time, 64% of the 236 periods since the index’s inception in 1994, the average international small-cap blend fund beat the index with average annual five-year returns that were about 200 basis points higher net of all fees for the mutual funds. This shows that the actual relative performance history aligns with our research—both suggest that international small-caps may present a fruitful opportunity for active managers. This research also shows that the universe of non-U.S. small-cap stocks is a fruitful starting point, giving active managers a number of opportunities to potentially prune the list of investment candidates. ¹There were 267 US Fund Foreign Small/Mid Blend Funds tracked by Morningstar with at least five years of performance history as of 12/31/18. 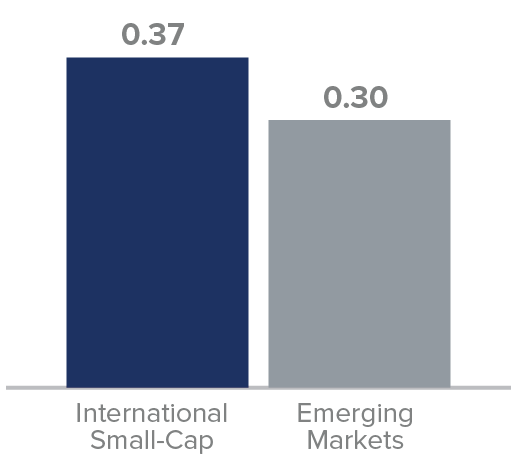 While we believe that our research makes a clear and compelling case for an international small-cap allocation, we understand that some investors will also want to know how the asset class has fared relative to emerging market stocks. This may be of particular relevance given that emerging markets equities have a similar reputation to small-cap stocks for both high returns and high risk. When we examined the history of these two asset classes, the results were consistent with our expectations. Emerging market companies mostly delivered slightly lower returns and they did so with considerably more risk. For example, based on rolling monthly five-year returns from 5/31/94-12/31/18, emerging market stocks returned 6.1% vs. 7.0% for international small-caps. In addition, the emerging markets return came with significantly higher volatility—a standard deviation of 22.9% for emerging market stocks vs. 17.4% for international small-caps. Past Performance is no guarantee of future results. “International Large-Cap” is represented by the MSCI ACWI ex USA Large-Cap Index, “International Small-Cap” by the MSCI ACWI ex USA Small-Cap Index, and “Emerging Markets” by the MSCI Emerging Markets Index. As one might guess, emerging market stocks’ combination of slightly lower returns with substantially higher volatility meant that international small-caps had a higher rolling monthly five-year risk-adjusted return. The heightened risks of emerging market stocks manifested itself most vividly perhaps by having deeper declines during down markets. There were seven declines of 15% or more since the inception of the MSCI ACWI ex USA index. During these seven periods, the median decline for international small-cap stocks was 25.9% versus 40.5% for emerging market stocks—which declined more in five of those seven periods. These deeper declines could create challenges for investors trying to stay the course for as long as is needed to achieve their long-term objectives. “International Small-Cap” is represented by the MSCI ACWI ex USA Small-Cap Index and “Emerging Markets” by the MSCI Emerging Markets. 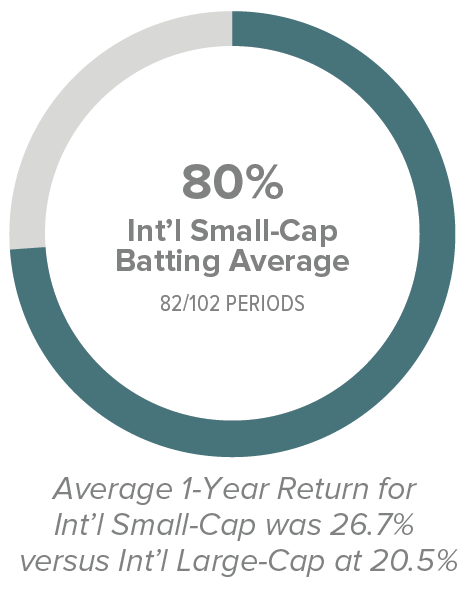 Overall, we suggest that a strategic allocation to international small-caps is an attractive option for asset allocators to consider—the asset class had significantly higher returns with modestly higher risk than international large-caps along with modestly lower returns but significantly lower risk than emerging market equities. The Russell 2000 Index is an unmanaged, capitalization-weighted index of domestic small-cap stocks. It measures the performance of the 2,000 smallest publicly traded U.S. companies in the Russell 3000 Index. The Russell 1000 Index is an unmanaged, capitalization-weighted index of domestic large-cap stocks. It measures the performance of the 1,000 largest publicly traded U.S. companies in the Russell 3000 Index. Index returns include net reinvested dividends and/or interest income. Source: MSCI. MSCI makes no express or implied warranties or representations and shall have no liability whatsoever with respect to any MSCI data contained herein. The MSCI data may not be further redistributed or used as a basis for other indexes or any securities or financial products. This report is not approved, endorsed, reviewed or produced by MSCI. None of the MSCI data is intended to constitute investment advice or a recommendation to make (or refrain from making) any kind of investment decision and may not be relied on as such. The MSCI ACWI ex USA Small Cap Index is an unmanaged, capitalization-weighted index of global small-cap stocks, excluding the United States. Index returns include net reinvested dividends and/or interest income. The MSCI ACWI ex USA Large Cap Index is an unmanaged, capitalization-weighted index of global large-cap stocks, excluding the United States. The MSCI ACWI ex USA Investible Market Index (IMI) is an unmanaged, capitalization-weighted index of global stocks, excluding the United States. The MSCI Emerging Markets Index is an unmanaged, capitalization-weighted index of stocks in emerging markets countries. Index returns include net reinvested dividends and/or interest income. The Bloomberg Barclays US Aggregate Bond Index is an unmanaged, capitalization-weighted index of investment grade, U.S. dollar-denominated, fixed-rate taxable bonds. The performance of an index does not represent exactly any particular investment, as you cannot invest directly in an index. Frank Russell Company (“Russell”) is the source and owner of the trademarks, service marks and copyrights related to the Russell Indexes. Russell® is a trademark of Frank Russell Company. Neither Russell nor its licensors accept any liability for any errors or omissions in the Russell Indexes and / or Russell ratings or underlying data and no party may rely on any Russell Indexes and / or Russell ratings and / or underlying data contained in this communication. No further distribution of Russell Data is permitted without Russell’s express written consent. Russell does not promote, sponsor or endorse the content of this communication. Any information, statements and opinions set forth herein are general in nature, are not directed to or based on the financial situation or needs of any particular investor, and do not constitute, and should not be construed as, investment advice, a forecast of future events, a guarantee of future results, or a recommendation with respect to any particular security or investment strategy. Investors seeking financial advice regarding the appropriateness of investing in any securities or investment strategies should consult their financial professional.